The revival of the Hebrew language took place in Europe and Israel toward the end of the 19th century and into the 20th century, through which the language's usage changed from the sacred language of Judaism to a spoken and written language used for daily life in Israel. The process began as a diversity of Jews started arriving and establishing themselves alongside the pre-existing Jewish community of Palestine in the first half of the nineteenth century, when veteran Jews in Palestine (largely Arabic-speaking by that time) and the linguistically diverse newly arrived Jews all switched to use Hebrew as a lingua franca, the historical linguistic common denominator of all the Jewish groups. At the same time, a parallel development in Europe changed Hebrew from primarily a sacred liturgical language into a literary language which played a key role in the development of nationalist educational programs. Modern Hebrew was one of three official languages of Mandatory Palestine, and after the Israeli Declaration of Independence in 1948, one of two official languages of Israel, along with Modern Arabic. In July 2018, a new law made Hebrew the sole official language of the state of Israel, with Arabic having "special status". More than purely a linguistic process, the revival of Hebrew was utilized by Jewish modernization and political movements, and became a tenet of the ideology associated with settlement of the land, Zionism and Israeli policy. The process of Hebrew's return to regular usage is unique; there are no other examples of a natural language without any native speakers subsequently acquiring several million native speakers, and no other examples of a sacred language becoming a national language with millions of "first language" speakers. The language's revival eventually brought linguistic additions with it. While the initial leaders of the process insisted they were only continuing "from the place where Hebrew's vitality was ended", what was created represented a broader basis of language acceptance; it includes characteristics derived from all periods of Hebrew language, as well as from the non-Hebrew languages used by the long-established European, North African, and Middle Eastern Jewish communities, with Yiddish (the European variant) being predominant. Mishneh Torah, written in Hebrew by Maimonides. Historical records testify to the existence of Hebrew from the 10th century BCE to the late Second Temple period (lasting to c. 70 CE), after which the language developed into Mishnaic Hebrew. (From about the 6th century BCE until the Middle Ages, many Jews spoke a related Semitic language, Aramaic.) From the 2nd century CE until the revival of Hebrew as a spoken language circa 1880, Hebrew served as a literary and official language and as the Judaic language of prayer. After the spoken usage of Mishnaic Hebrew ended in the 2nd century CE, Hebrew had not been spoken as a mother tongue. Even so, during the Middle Ages, Jews used the language in a wide variety of disciplines. This usage kept alive a substantial portion of the traits characteristic of Hebrew. First and foremost, Classical Hebrew was preserved in full through well-recognized sources, chiefly the Tanakh (especially those portions used liturgically like the Torah, Haftarot, Megilot, and the Book of Psalms) and the Mishnah. Apart from these, Hebrew was known through hymns, prayers, midrashim, and the like. During the Middle Ages, Hebrew continued in use as a written language in Rabbinical literature, including in judgments of Halakha, Responsa, and books of meditation. In most cases, certainly in the base of Hebrew's revival, 18th- and 19th-century Europe, the use of Hebrew was not at all natural, but heavy in flowery language and quotations, non-grammatical forms, and mixing-in of other languages, especially Aramaic. Ashkenazi Hebrew, used by Eastern and Western European Jews, maintained mostly the structure of vowels but may have moved the stress and lost the gemination, although this cannot be known for certain, as there are no recordings of how the language (or its respective dialects) sounded e.g. in Kana'an; Ashkenazi Hebrew pronunciation has a variation of vowels and consonants, which follows closely the variation of the vowel and consonant signs written down by the masoretes around the 7th century CE, indicating that there is a strong link with the language heard by them. For example, where we see two different vowel signs, or a consonant with or without a dogeish (dagesh), a difference is also heard in the various Ashkenazic pronunciations. Sephardi Hebrew, used by Sephardi Jews, preserved a structure different from the recognized Tiberian Hebrew niqqud of only five vowels, but did preserve the consonants, the grammatical stress, the dagesh, and the schwa; however, different ways of writing consonants are not always heard in all Sephardic pronunciations. For example, the Dutch Sephardic pronunciation does not distinguish between the beth with and without dagesh: both are pronounced as "b". The "taf" is always pronounced as "t", with or without dagesh. There are at least two possibilities to explain the merger: the difference disappeared over time in the Sephardic pronunciations, or it never was there in the first place: the pronunciation stems from a separate Hebrew dialect, which always was there, and which for example the Masoretes did not use as reference. Yemenite Hebrew, thought by Aaron Bar-Adon to preserve much of the Classical Hebrew pronunciation, was barely known when the revival took place. Within each of these groups, there also existed different subsets of pronunciation. For example, differences existed between the Hebrew used by Polish Jewry and that of Lithuanian Jewry and of German Jewry. In the fifty years preceding the start of the revival process, a version of spoken Hebrew already existed in the markets of Jerusalem. The Sephardic Jews who spoke Ladino or Arabic and the Ashkenazi Jews who spoke Yiddish needed a common language for commercial purposes. The most obvious choice was Hebrew. Although Hebrew was spoken in this case, it was not a native mother tongue, but more of a pidgin. In the Arab Middle East, Ladino and Colloquial Arabic were the spoken languages most prevalent in Jewish communities (with Ladino more prevalent in the Mediterranean and Arabic, Aramaic, Kurdish, and Persian more widely spoken by Jews in the East), while Classical Arabic was used for secular writing, and Hebrew used for religious purposes (though some Jewish scholars from the Arab world, such as Maimonedes (1135-1204), wrote primarily in Arabic or in Judeo-Arabic languages). The revival of the Hebrew language in practice advanced in two parallel strains: The revival of written-literary Hebrew and the revival of spoken Hebrew. In the first few decades, the two processes were not connected to one another and even occurred in different places: Literary Hebrew was renewed in Europe's cities, whereas spoken Hebrew developed mainly in Palestine. The two movements began to merge only in the beginning of the 1900s, and an important point in this process was the immigration of Haim Nahman Bialik to Palestine in 1924. But after the transfer of literary Hebrew to Palestine, a substantial difference between spoken and written Hebrew remained, and this difference persists today. The characteristics of spoken Hebrew only began to seep into literature in the 1940s, and only in the 1990s did spoken Hebrew start widely appearing in novels. First known translation of Shakespeare to Hebrew by Solomon Löwishn, 1816. The "Are at this hour asleep!" monologue from Henry IV, Part 2. A preceding process to the revival of literary Hebrew took place during the Haskalah, the Jewish movement paralleling the secular Enlightenment. Members of this movement, called maskilim (משכילים), who sought to distance themselves from Rabbinic Judaism, decided that Hebrew, specifically Biblical Hebrew, was deserving of fine literature. They considered Mishnaic Hebrew and other varieties of Hebrew to be defective and unfit for writing. The Haskalah-era literature written in Hebrew based itself upon two central principles: Purism and flowery language. Purism was a principle which dictated that all words used should be of biblical origin (even if the meaning was not biblical). The principle of flowery language was based on bringing full verses and expressions as they were from the Tanakh, and the more flowery a verse was, the more quality it was said to possess. Another linguistic trait thought to increase a text's prestige was the use of hapax legomena, words appearing only once in the text. But while it was easy to write stories taking place in the biblical period and dealing with biblical topics, Haskalah-era writers began to find it more and more difficult to write about contemporary topics. This was due mostly to the lack of a broad and modern vocabulary, meaning translating books about science and mathematics or European literature was difficult. Although an earlier, little known attempt at scientific writing was made when Israel Wolf Sperling translated Jules Verne's 20,000 Leagues Under the Sea and Journey to the Center of the Earth in 1877 and 1878, this barrier was breached with more lasting effect in the 1880s by a writer named Mendele Mocher Sfarim. Another difficulty faced by Haskalah Hebrew writers was that the audience was exclusively male with profound study background, which meant that women and the less educated men were pushed against reading Hebrew by reading Yiddish literature, which led a number of writers to write in Yiddish to find audiences. Ya'akov Abramovitch (1846-1917), is often known by the name of his main character, "Mendele Mocher Sfarim" (מוכר ספרים), meaning "bookseller." He began writing in Hebrew as a Haskalah writer and wrote according to all the conventions of Haskalah-era literature. At a certain point, he decided to write in Yiddish and caused a linguistic revolution, which was expressed in the widespread usage of Yiddish in Hebrew literature. After a long break he returned in 1886 to writing in Hebrew, but decided to ignore the rules of biblical Hebrew, and proponents of that style, like Abraham Mapu, and added into the vocabulary a host of words from the Rabbinic Age and the Middle Ages. His new fluid and varied style of Hebrew writing reflected the Yiddish spoken around him, while still retaining all the historical strata of Hebrew. Mendele's language was considered a synthetic one, as it consisted of different echelons of Hebrew development and was not a direct continuation of a particular echelon. However, today, his language is often considered a continuation of Rabbinic Hebrew, especially grammatically. He was considered as the representative figure who provided great literatures to whichever language he was associated with. Devorah Baron (also spelled Dvora Baron and Deborah Baron) (December 4, 1887 - August 20, 1956), was a Hebrew writer who fascinated the readers by her uniqueness of the language in Eastern Europe, which was dominant by Yiddish speakers. Her early writings mostly involve the feminine Yiddish traditions, and she worked on more feminist topics in her later writings. The topics were mostly divided into two sort:(1) the marginalization of female in the religious and family life;(2) the tension between men and women, and between generation to generation. See also Robert Alter, and his book The Invention of Hebrew Prose, who has done significant work on modern Hebrew literature and the context which enabled the language to revive itself via creative writing. The book has a large section on Abramovitch. Yael S. Feldman also gives a short overview of Mendele and his milieu in her book Modernism and Cultural Transfer. She notes the influence of Yiddish on his Hebrew, and traces this language interaction to Gabriel Preil, the last Haskalah poet of America. Eventually, writers like Yosef Haim Brenner would break from Mendele's style, and utilize more experimental techniques. Mendele's style was excitedly adopted by contemporary writers and spread quickly. It was also expanded into additional fields: Ahad Ha'am wrote an article in 1889 using the style entitled "This is not the Way," and Haim Nahman Bialik expanded it into poetry with his poem "To the Bird" of the same year. Additionally, great efforts were taken to write scientific books in Hebrew, for which the vocabulary of scientific and technical terms was greatly increased. At the same time, Europe saw the rise of Hebrew language newspapers and magazines, while even sessions and discussions of Zionist groups were conducted and transcribed in Hebrew. In addition, poets and writers such as David Frischmann and Sha'ul Tschernichovsky began avidly translating European works into Hebrew, from the Finnish epic the Kalevala to works by Molière, Goethe, Shakespeare, Homer, Byron, Lermontov, and Aeschylus. At the same time, writers like Micah Yosef Berdichevsky and Uri-Nissan Gnessin began to write complex works of short fiction and novels in Hebrew, using the language to express psychological realism and interiority for the first time. As Hebrew poets and writers began arriving in Palestine armed with the new literary language, they exerted a certain amount of influence on the development of spoken Hebrew as well. Jewish communities with different colloquial languages had used Hebrew to communicate with each other across Europe and the Near East since the Middle Ages. As Jews in Palestine spoke a variety of languages such as Arabic, Ladino, Yiddish, and French, inter-communal affairs that required verbal communication were handled in a modified form of Medieval Hebrew. Hebrew was used by Jews from different linguistic backgrounds in marketplaces in Jerusalem since at least the early 19th century. Eliezer Ben-Yehuda (1858–1922) (אליעזר בן יהודה), is often regarded as the "reviver of the Hebrew language" ("מחיה השפה העברית"), yet his major contributions were ideological and symbolic; he was the first to raise the concept of reviving Hebrew, to publish articles in newspapers on the topic, and he took part in the project known as the Ben-Yehuda Dictionary. However, what finally brought about the revitalization of Hebrew were not Ben-Yehuda's activities in Jerusalem (at least for the most part), but developments in the settlements of the First Aliyah and the Second Aliyah. The first Hebrew schools were established in these settlements, Hebrew increasingly became a spoken language of daily affairs, and finally became a systematic and national language. Yet Ben-Yehuda's fame and notoriety stems from his initiation and symbolic leadership of the Hebrew revival. Ben-Yehuda's main innovation in the revival of the Hebrew language lies in his having "invented" many new words to denote objects unknown in Jewish antiquity, or which had long been forgotten in their original Hebrew usage and context. He invented words such as ḥatzil (חציל) for an eggplant (aubergine) and ḥashmal (חשמל) for electricity. As no Hebrew equivalent could be found for the names of certain produce endemic to the New World, they devised new Hebrew words for maize and tomato, calling them tiras (תירס) and ʿagbaniyyah (עגבניה), respectively. The latter word is derived from the shape of the vegetable, which resembled buttocks (ʿagaḇīm), and which was originally thought by the new immigrants to enhance one's love-life. The new name, suggested by Yechiel Michal Pines, was rejected by Ben-Yehudah, who thought it too vulgar, suggesting instead that it be called badūrah. At length, the name ʿagbaniyyah supplanted the other name. Sometimes, old Hebrew words took on different meanings altogether. For example, the Hebrew word kǝvīš (כביש), which now denotes a "street" or a "road," is actually an Aramaic adjective meaning "trodden down; blazoned", rather than a common noun. It was originally used to describe "a blazoned trail." In what most rabbis view as an error, Ben-Yehuda is accredited with introducing the new Hebrew word ribah (ריבה) for "confiture; marmalade", believing it to be derived from the lexical root reḇaḇ, and related to the Arabic word murabba (jam; fruit conserves; marmalade). He also invented the word tapuz (תפוז) for the citrus fruit orange, which is a combination of tapuaḥ (apple) + zahav (golden), or "golden apple." The revival of spoken Hebrew can be separated into three stages, which are concurrent with (1) the First Aliyah, (2) the Second Aliyah, and (3) the British Mandate period. In the first period, the activity centered on Hebrew schools in the Settlements and in the Pure Language Society; in the second period, Hebrew was used in assembly meetings and public activities; and in the third period, it became the language used by the Yishuv, the Jewish population during the Mandate Period, for general purposes. At this stage, Hebrew possessed both spoken and written forms, and its importance was reflected in the official status of Hebrew during the British Mandate. All of the stages were characterized by the establishment of many organizations that took an active and ideological part in Hebrew activities. This resulted in the establishment of Hebrew high schools (גימנסיות), the Hebrew University, the Jewish Legion, the Histadrut labor organization, and in Tel Aviv – the first Hebrew city. Throughout all periods, Hebrew signified for both its proponents and detractors the antithesis of Yiddish. Against the exilic Yiddish language stood revived Hebrew, the language of Zionism, of grassroots pioneers, and above all, of the transformation of the Jews into a Hebrew nation with its own land. Yiddish was degradingly referred to as a jargon, and its speakers encountered harsh opposition, which finally led to a Language War between Yiddish and Hebrew. Nonetheless, Ghil'ad Zuckermann believes that "Yiddish is a primary contributor to Israeli Hebrew because it was the mother tongue of the vast majority of language revivalists and first pioneers in Eretz Yisrael at the crucial period of the beginning of Israeli Hebrew". According to Zuckermann, although the revivalists wished to speak Hebrew with Semitic grammar and pronunciation, they could not avoid the Ashkenazi mindset arising from their European background. He argues that their attempt to deny their European roots, negate diasporism and avoid hybridity (as reflected in Yiddish) failed. "Had the language revivalists been Arabic-speaking Jews (e.g. from Morocco), Israeli Hebrew would have been a totally different language – both genetically and typologically, much more Semitic. The impact of the founder population on Israeli Hebrew is incomparable with that of later immigrants." With the rise of Jewish nationalism in 19th-century Europe, Eliezer Ben-Yehuda was captivated by the innovative ideas of Zionism. At that time, it was believed that one of the criteria needed to define a nation worthy of national rights was its use of a common language spoken by both the society and the individual. On 13 October 1881, while in Paris, Ben-Yehuda began speaking Hebrew with friends in what is believed to be the first modern conversation using the language. Later that year, he made aliyah and came to live in Jerusalem. In Jerusalem, Ben-Yehuda tried to garner support for the idea of speaking Hebrew. He determined that his family would only speak Hebrew, and raised his children to be native Hebrew speakers. His first child, a son named Itamar Ben-Avi, who was born in Jerusalem on 31 July 1882, became the first native speaker of Modern Hebrew. Ben-Yehuda attempted to convince other families to do so as well, founded associations for speaking Hebrew, began publishing the Hebrew newspaper HaZvi, and for a short while taught at Hebrew schools, for the first time making use of the method of "Hebrew in Hebrew." In 1889, there were plays in Hebrew and schools teaching children to speak Hebrew. Ben-Yehuda's efforts to persuade Jewish families to use only Hebrew in daily life at home met very limited success. According to Ben-Yehuda, ten years after his immigration to Palestine, there were only four families in Jerusalem that used Hebrew exclusively. According to the Hashkafa newspaper, there were ten such families in 1900. On the other hand, during the Ottoman era, widespread activity began in the moshavot, or agricultural settlements, of the First Aliyah, which was concentrated in the Hebrew schools. A Hebrew boarding school was established by Aryeh Leib Frumkin in 1884, where religious studies were conducted in Hebrew and students spoke Hebrew with their teachers and among themselves. 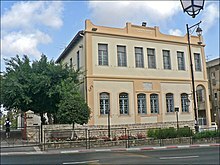 In 1886, a Hebrew school was established in the Jewish settlement of Rishon LeZion, where a part of the classes were taught in Hebrew. From the 1880s onward, schools in the agricultural settlements gradually began teaching general subjects in Hebrew. In 1889, Israel Belkind opened a school in Jaffa which taught Hebrew and used it as the primary language of instruction. It survived for three years. The Literature Council, which was based on the Pure Language Society, in 1890, to experiment in the municipal and rural schools, showed the possibility to make Hebrew the only language in the settlement. At this point, progress was slow, and it encountered many difficulties: parents were opposed to their children learning in an impractical language, useless in higher education; the four-year schools for farmers' children were not of a high caliber; and a great lack of linguistic means for teaching Hebrew plus the lack of words to describe day-to-day activities, not to mention the absence of Hebrew schoolbooks. Added to these, there was no agreement on which accent to use, as some teachers taught Ashkenazi Hebrew while others taught Sephardi Hebrew. In 1889, Ben-Yehuda, together with rabbis Yaakov Meir and Chaim Hirschensohn and educator Chaim Kalmi, founded the Clear Language Society, with the goal of teaching Hebrew. The company taught Hebrew and encouraged Hebrew education in schools, heders, and yeshivas. Initially, it hired Hebrew-speaking women to teach Jewish women and girls spoken and written Hebrew. In 1890, the company established the Hebrew Language Committee, which coined new Hebrew words for everyday use and for a wide variety of modern uses and encouraged the use of grammatically correct Hebrew. Although the organization collapsed in 1891, the Hebrew Language Committee continued to function. It published books, dictionaries, bulletins, and periodicals, inventing thousands of new words. The Hebrew Language Committee continued to function until 1953, when it was succeeded by the Academy of the Hebrew Language. A Hebrew boys' school opened in Jaffa in 1893, followed by a Hebrew girls' school. Although some subjects were taught in French, Hebrew was the primary language of instruction. Over the next decade, the girls' school became a major center of Hebrew education and activism. In 1898, the first Hebrew kindergarten opened in Rishon LeZion. It was followed by a second one in Jerusalem in 1903. In 1903, the Union of Hebrew Teachers was founded, and sixty educators participated in its inaugural assembly. Though not extremely impressive from a quantitative viewpoint, the Hebrew school program did create a nucleus of a few hundred fluent Hebrew speakers and proved that Hebrew could be used in the day-to-day context. As the Second Aliyah began, Hebrew usage began to break out of the family and school framework into the public venue. Motivated by an ideology of rejecting the Diaspora and its Yiddish culture, the members of the Second Aliyah, established relatively closed-off social cells of young people with a common world view. In these social cells – mostly in the moshavot – Hebrew was used in all public assemblages. Though not spoken in all homes and private settings yet, Hebrew had secured its place as the exclusive language of assemblies, conferences, and discussions. Educated Second Aliyah members already were familiar with the literary Hebrew that had developed in Europe, and they identified with the notion that Hebrew could serve as an impetus for the national existence for the Jewish people in Israel. This group was joined by the aforementioned graduates of Hebrew schools, who had already begun to raise native-born speakers of Hebrew in their families. During this period, the World Zionist Congress also adopted Hebrew as its official language. Hebrew education continued to expand, as more and more Hebrew educational institutions came about. The number of Hebrew kindergartens continued to grow. In 1905, Yehuda Leib and Fania Matman-Cohen, a couple of educators, began teaching the first high school classes in Hebrew in their apartment in Jaffa. Hebrew teachers recreated the Hebrew Language Committee, which began to determine uniform linguistic rules, as opposed to the disjointed ones which had arisen previously. The Council declared as its mission "to prepare the Hebrew language for use as a spoken language in all affairs of life," formulated rules of pronunciation and grammar, and offered new words for use in schools and by the general public. The widespread production of Hebrew schoolbooks also began, and Mother Goose-style rhymes were written for children. During the first decade of 20th century, Epstein's and Wilkomitz's Hebrew education, which restricted the children from speaking Yiddish not only in school, but also at home and on the street, made progress toward wider use of Hebrew. The first native speakers of Hebrew, who had mainly learned it in the Hebrew schools of the First Aliyah period and came to speak it as their primary language, reached adulthood during this time. Aside from rare exceptions who had been born prior such as Itamar Ben-Avi, the first generation of children who acquired Modern Hebrew as native speakers at home from their parents rather than mainly learning it at school were born during this decade, to parents who had attended the Hebrew schools of the First Aliyah period. In addition, many of the Jewish immigrants during this period had reasonable Hebrew reading proficiency acquired from their education prior to arriving in the country. Most still learned it as a second language. Due to the growth of the number of native speakers and proficiency among second language speakers, the Hebrew press was able to grow. During this period, it greatly increased in popularity and circulation. In 1912, it was observed that there was hardly a young Jew in the country who could not read a Hebrew newspaper. In 1909, the first Hebrew city, Tel Aviv, was established. In its streets and in cafes, Hebrew was already widely spoken. The entire administration of the city was carried out in Hebrew, and new olim or those not yet speaking Hebrew were forced to speak in Hebrew. Street signs and public announcements were written in Hebrew. A new building for the Herzliya Hebrew Gymnasium, a continuation of the first Hebrew high school established by the Matman-Cohen's, was built in the city that same year. The pinnacle of Hebrew's development during this period came in 1913, in the so-called "War of the Languages:" The Company for Aiding German Jews, then planning the establishment of a school for engineers (first known as the Technikum and for which construction had begun in 1912), insisted that German should be its language of instruction, arguing among other things that German possessed an extensive scientific and technical vocabulary while a parallel vocabulary drawn from Hebrew would need to be created from scratch, often using calques or translations of terms anyway. Substantial unanimity of opinion in the Yishuv ran against this proposal, which was defeated, leading to the founding of Israel's foremost institute of technology, the Technion, with a curriculum taught in Hebrew. This incident is seen as a watershed marking the transformation of Hebrew into the official language of the Yishuv. Researchers studying the Google Books database noted a fivefold increase in the rate of appearance of new words in printed Hebrew between books published in 1915 and 1920, which they credit to the Balfour Declaration of 1917 and the Second Aliyah. As a greater number of children passed through Hebrew language schools, the number of people who spoke Hebrew as their first language grew. As the number of people whose primary language was Hebrew increased, so did demand for Hebrew reading materials and entertainment such as books, newspapers, and plays. By 1916-1918, about 34,000 Jews in Palestine recorded Hebrew as their native language. After World War I, it was legislated by the Mandate over Palestine that English, Hebrew, and Arabic would be the official spoken languages of Palestine. As the Jewish community in Palestine, or Yishuv grew, the immigrants arriving from the diaspora did not speak Hebrew as a mother tongue, and learned it as a second language either prior to their immigration or in Palestine, while their children picked up Hebrew as their native language. At this time, the use of Hebrew as the lingua franca of the Yishuv was already a fait accompli, and the revival process was no longer a process of creation, but a process of expansion. In Tel Aviv, the Legion of the Defenders of the Language was established, which worked to enforce Hebrew use. Jews who were overheard speaking other languages on the street were admonished: "Jew, speak Hebrew" (Yehudi, daber ivrit/יהודי, דבר עברית), or, more alliteratively, "Hebrew [man], speak Hebrew" (Ivri, daber ivrit/עברי, דבר עברית) was a campaign initiated by Ben-Yehuda's son, Itamar Ben-Avi. The Academy of Hebrew Language focused on the structure and the spelling of Hebrew, and prompted the issues about the further expansion of the use of Hebrew in Mandatory Palestine. The Academy worked with the Language College to publish the Ben-Sira in a scientific form. By the time Israel gained independence in 1948, 80.9% of Jews who had been born in Palestine spoke Hebrew as their only language in daily life, and another 14.2% of Palestine-born Jews used it as a first among two or more languages. The small minority Jews who had been born in Palestine but did not use Hebrew as their first language had mainly grown up before the development of the Hebrew school system. Following Israeli independence, large waves of Jewish refugees came from Europe, North Africa, the Middle East, and other parts of the world. The Israeli population increased significantly, doubling within a short period of time. These immigrants spoke a variety of languages, and had to be taught Hebrew. While immigrant children were expected to learn Hebrew through school, much effort was put into ensuring adults would learn the language. The institution of the ulpan, or intensive Hebrew-language school, was established to teach immigrants basic Hebrew language skills, and an ulpan course became a major feature of the experience of immigrating to Israel. Young adult immigrants picked up much of their Hebrew through mandatory military service in the Israel Defense Forces, which aimed to teach soldiers Hebrew so they could function in the military and post-military civilian life. During the 1950s, Hebrew was taught in most military bases by recruited teachers and female soldiers. A 1952 order demanded that soldiers be taught Hebrew until they could converse freely on everyday matters, write a letter to their commander, understand a basic lecture, and read a vowelized newspaper. Soldiers also absorbed Hebrew through their regular service. Soldiers who were about to finish their service without a grasp of Hebrew deemed sufficient were sent to a special Hebrew school founded by the army for the last three months of their service. Immigrants from Arab countries tended to pick up Hebrew faster than European immigrants. In daily life, immigrants largely limited their use of Hebrew to when they needed to, most often in their working lives, and to a somewhat lesser extent to satisfy cultural needs. They tended to use their native languages more when socializing and interacting with family. In 1954, about 60% of the population reported the use of more than one language. The children of these immigrants tended to pick up Hebrew as their first language, while their parents' native languages were either used as second languages or lost to them altogether. The Israeli Arab minority also began learning Hebrew, as Hebrew lessons were introduced into Arab schools. ^ Parfitt, Tudor (1972) 'The Use of Hebrew in Palestine 1800–1822.' Journal of Semitic Studies, 17 (2). pp. 237-252. ^ Parfitt, Tudor (1983) 'Ahad Ha-Am's Role in the Revival and Development of Hebrew.' In: Kornberg, J., (ed. ), At the crossroads: essays on Ahad Ha-am. New York: State University of New York Press, pp. 12-27. ^ Parfitt, Tudor (1995) 'Peretz Smolenskin, the Revival of Hebrew and Jewish Education.' In: Abramson, G. and Parfitt, T., (eds. ), Jewish education and learning : published in honour of Dr. David Patterson on the occasion of his seventieth birthday. Chur, Switzerland: Harwood Academic Publishers, pp. 1-11. ^ "Israeli Law Declares the Country the 'Nation-State of the Jewish People'". Retrieved 2018-07-21. ^ Paul Johnson, A History of the Jews, p.442. " Yet in all [of young David Ben-Gurion's] activity, three salient principles remained constant. First, Jews must make it their priority to return to the land; ‘the settlement of the land is the only true Zionism, all else being self-deception, empty verbiage and merely a pastime’. [Quoted in Encyclopaedia Judaica, iv 506.] Second, the structure of the new community must be designed to assist this process within a socialist framework. Third, the cultural binding of the Zionist society must be the Hebrew language. ^ a b c Bar-Adon, Aaron (1975). The Rise And Decline of a Dialect ---- A Study in the Revival of Modern Hebrew. ^ Eliav, Mordechai (1978). Eretz Israel and Its Yishuv in the 19th Century, 1777-1917. ^ a b Izre'el, Shlomo. "The Emergence of Spoken Israeli Hebrew" (PDF). ^ "Online Books by Israel Wolf Sperling". onlinebooks.library.upenn.edu. University of Pennsylvania. Retrieved 26 September 2016. ^ a b c d Seidman, Naomi (1997). A Marriage Made in Heaven---The Sexual Politics of Hebrew and Yiddish. University of California Press. ISBN 0-520-20193-0. ^ Bar-Adon, Aaron (1977). S.I. Agnon utchiyat halashon ha'ivrit. Jerusalem. ^ Harshav, Benjamin (2009), "Flowers Have No Names: The revival of Hebrew as a living language after two thousand years was no miracle", Natural History, 118 (#1 February): 24–29 . ^ These words are marked as "New Words" in the Even-Shoshan Hebrew Dictionary, s.v. חצילים; see: Modern Hebrew usages. Ḥashmal is found only once in the Hebrew Bible, in Ezekiel's vision of the chariot (Ezek. 1:4; 1:27), but has been explained in a medieval Judeo-Arabic lexicon (reprinted in the book, Jewish Culture in Muslim Lands and Cairo Geniza Studies, ed. Yosef Tobi, Tel-Aviv University: Tel-Aviv 2006, p. 61 [note 114]) as being some angelic entity which had "utmost strength". Others have explained it to mean an angel that changes hues. ^ Kenan, Ruti (29 July 2007). "Tomato - Red Love" (in Hebrew). Ynet. Retrieved 9 December 2018. ^ Compare Rashi's commentary on Exodus 9:17, where he says the word mesilah is translated in Aramaic oraḥ kevīsha (A blazoned trail); the word "kevīsh" being only an adjective or descriptive word, but not a common noun as it is used today. It is said that Ze'ev Yavetz (1847–1924) is he that coined this modern Hebrew word for “road.” See Haaretz, Contributions made by Ze'ev Yavetz; Maltz, Judy (25 January 2013). "With Tu Bishvat Near, a Tree Grows in Zichron Yaakov". Haaretz. Retrieved 27 March 2017. ^ Eliezer Ben-Yehuda on the use of the word ribah for confiture (in Hebrew). Ha-Zvi, 9 March 1888. ^ a b c d e Saulson, Scott B. (1979). Institutionalized Language Planning --- Documents and Analysis of the Revival of Hebrew. Mouton Publishers. ISBN 90-279-7567-1. ^ a b See p. 63 in Zuckermann, Ghil'ad (2006), "A New Vision for 'Israeli Hebrew': Theoretical and Practical Implications of Analysing Israel's Main Language as a Semi-Engineered Semito-European Hybrid Language", Journal of Modern Jewish Studies 5 (1), pp. 57-71. ^ Omer-Man, Michael (12 October 2011). "This Week in History: Hebrew goes conversational". The Jerusalem Post. Retrieved 12 October 2012. ^ Haramati, Sh (1979). Reshit hachinuch ha'ivri ba'arec utrumato lehachya'at halashon. ^ Alexander M. Petersen, Joel Tenenbaum, Shlomo Havlin, and H. Eugene Stanley. "Statistical Laws Governing Fluctuations in Word Use from Word Birth to Word Death." Scientific Reports 2, Article number: 313 (2012). Let my people know!, Ghil'ad Zuckermann, Jerusalem Post, 18 May 2009.